Interview with APQC and Shelley Sweet on Why Process Improvements Evaporate. White paper on the topic on Publications Page. Corporations track specific financial measures, use operational measures to monitor their core business, and collect some customer satisfaction measures. However, as companies move to a more process-centric approach they need to think about measures for each process and sub process, and these are often not captured today. One company I worked with had over 400 operational measures but very few process measures. They began with a system wide top down approach, modeling the eight core processes of the enterprise (level one processes) and several level two processes within each of those eight core processes. They defined the goals of each level one and level two process and then identified measures that would show how they performed against that goal. Clearly, this is a comprehensive approach. But when I worked with some of these process owners six to nine months later I found that many groups were not tracking these measures. So far, the process measures had been a business process management exercise; they were still only tracking the financial and operational measures. So where do you begin? I have found that selecting a few measures and really capturing them and monitoring them is the best way to start. Start small, and use the measures. The overriding reason to measure is to make decisions and take action. Measures provide you the quantitative data to make decisions objectively. So carefully consider who wants the measure in the organization and what he/she will do with the measure once they know it. In fact, ask that decision maker to articulate what action he/she will take and if that person doesn’t know, don’t start measuring. Let’s take an example to see how to select and capture measures in reality. I will use the Hiring process. The external consultant (or internal facilitator), process sponsor, and project lead develop the high-level map. It sets the scope, helps identify who should be on the team, and identifies the sponsor’s improvement targets. The improvement targets articulate the sponsor’s goals for the project. There should only be one or two improvement targets and they need to be quantifiable. Here’s your first chance for measures! Improvement Target #1: Standardize the recruiting process for our organization. Improvement Target #2: Make the process more efficient. The first target is quantifiable. 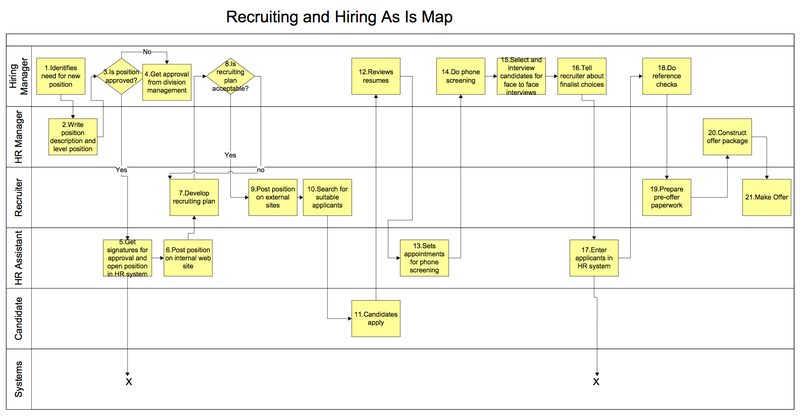 It implies we want one standard process- not 15 (there’s a current measure too) for doing recruiting in the organization.” But the second target is not yet quantified. Here’s where we need to get some data. We decided to use ‘Time to job fill ‘or the time from the initial request to when a candidate is hired. The sponsor also wanted to reduce the amount of paperwork in the system, so we noted each place where there was paper or re-entry from paper into the system. There were 22 different checklists (some were for different information and others were different formats of similar information in different units), reentry of information from paper occurred at three key places in the process- candidate information from the request, when they entered from any recruiting site, and a third time when they were accepted or rejected by the hiring manager. These can be identified by step once you do the more detailed swim lane map. At this initial stage of the process, you may need to develop a business case, because you want the sponsor and corporation to take action to pay attention and improve this process. So benchmark your process against other industries or competitors and find out what the best practice numbers are. Then communicate the gap between your numbers and other organizations. In this case, “Time to job fill’ would make for a good comparison. What started happening is that recruiters, hiring managers, and HR directors began quoting current measures, discussing them with hiring managers, and working to improve them. Identifying the measures and tracking them begins that discussion and suggests some actionable improvements. The science of measures means applying rigor, methodology and accepted standards to your measures. This is a goal, and will not be where you start. Use the three measurement areas suggested, refine selected measures, and move useful measures from manual to automated; use the measures in analysis to learn and take action. Once you are able to establish acceptable ranges for different measures, your measures will tell you whether you process is healthy or not, determining if you need to take any action or not. Start with a few process measures that track the health of the process, signal early detection of success or difficulty, and show performance gaps. And, as you identify these measures know there is an art to finding useful measures and a politics to introducing them. So keep you eye on the focus: what action will I take when I see this measure? Profitability or Stagnation? Efficiencies or Deficiencies? It’s Your Choice. Leaning Your Organization: Does that Mean Cutting Jobs? Standardization or Flexibility – Partners or Enemies? Copyright © 2019 i4Process. All Rights Reserved.